Banana plants need fertile soil and an abundance of soil moisture for best growth and production. The development rate the plant makes in its first 3-4 months determines the weight of the bunch and the number of hands. Consequently, it is essential to provide the best care during this period. Placement - Soluble potassium, phosphorus and nitrogen fertilizers can be made easily available to the roots after planting. Application can be done in various forms; 1) Soil application broadcast or localized. Since banana roots quickly ramify away from the pseudostem, fertilizers should be rather broadcast than concentrated around the pseudostem. Timing - Fertilizing schedule should coincide with climatic conditions and phenological stages of the crop. Frequency - Frequent applications are especially important where the soil is light and lacking in fertility and when rainfall is heavy. Because of its limited mobility in the soil, P fertilizers should be applied once or twice annually in the subtropics. N, K fertilizers are normally applied at short intervals via the irrigation system. In humid tropics, intensive leaching due to extremely heavy showers dictates immediate fertilization via soil application in order to compensate for leaching losses. Application frequency can be reduced significantly when Multicote™, controlled-release fertilizer, is used. By using Multicote™, less leaching of plant nutrients, if any, will occur and less applications are required. Uptake of macronutrients is in the following mass order: Potassium (K) > Nitrogen (N) > Calcium (Ca) > Magnesium (Mg) > Phosphorus (P), see table 21. Uptake of micronutrients is in the following mass order: Manganese (Mn) > Iron (Fe) > Boron (B) > Zinc (Zn) > Copper (Cu). N, P, K, Mg, and Cu have a high re-translocation rate compared to other nutrients. Critical leaf N:K ratio for optimum yields varies between 1:1 and 1:1.6, depending on method for leaf analysis. “Finger Drop” (Dégrain) – a post-harvest problem of ripe banana bunches, called. Finger Drop occurs during hot, wet seasons in tropics, if K supply is low, so that NH4+ accumulates. e.g. problems with high Na:(K+Mg+Ca) ratio as in Canary Islands (Banana Nutrition : Lahav & Turner) IPI-Bulletin No 7 (1985); Banano (ed. : Rosero Ruano); Godefroy-Lachenoud, 1978). Here again, Multi-K™, either water soluble or Multicote, a coated CRF potassium nitrate, can not only be ideal source of K+, but also due to the antagonistic cation (K+) effect, can reduce or prevent the uptake of sodium. Soil tests should be practiced to establish an effective, economical fertilizer program. The soil test for N is often considered an unreliable indicator of soil N status under banana, as close relationships between soil N test and banana response to applied N are difficult to obtain. Bananas perform best in soils with a pH of 5.0 (calcium chloride) or above. The table below provides a guide to preferred levels for bananas from a typical soil test. As a result, soil test information is usually combined with local knowledge as variation occurs between areas (Tab. 24) to construct an optimal fertilization program. 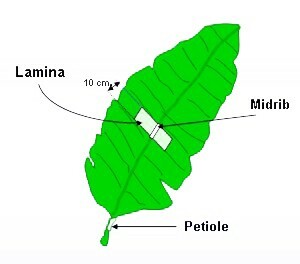 For many years, leaf samples were taken from the 7th petiole and from the 3rd lamina. During these years hardly any changes took place in the laminae nutrient standards, while over the years, increased levels of N, P and K in the petioles, were adopted (Fig. 44). Also, the vegetative mass of banana plants was increased, mainly due to better varieties, intensified fertilization schedules and rates. Consequently, nutrient content in plants increased as well (Tab. 24). The third leaf from the top of the pseudostem of recently flowering (shot) plants is usually sampled for analysis. Samples are taken from the leaf parts at different positions on the plant (Fig 45. When to sample: The samples should be taken either just before flowering or following floral emergence and when all female hands are visible. Which tissue to sample: In most banana-producing countries the laminar structure of leaf 3 is sampled for tissue analysis (IRS method, 1975). However, samples of the central vein of leaf 3 and the petiole of leaf 7 are also used. The laminar structure of leaf 3 is sampled by removing a strip of tissue 10 cm wide, on both sides of the central vein, and discarding everything but the tissue that extends from the central vein to the center of the lamina. Removal of plant nutrients in the harvested banana fruit is one of the major considerations in formulating fertilizer recommendations. The quantities of plant nutrients contained in the whole plant and in the fresh fruit harvested and removed from the field, are the basis for scheduling the fertilization program. The large amounts of K reflect the high K content in the fruit. When the previous crop is being left in the field, the contribution of recycled plant nutrients should be taken into consideration (Tab. 32). constant need for small Mg amounts throughout the growth period. The most rapid S uptake occurs from sucker to shooting stage. After shooting the uptake rate is reduced. The form of nitrogen (N) either ammonium (NH4+) or nitrate (NO3-), plays an important role when choosing the right fertilizer for Nutrigation of banana plants. Nitrate-nitrogen (NO3-) is a preferable source of nitrogen as it suppresses the uptake of chloride (Cl-) and at the same time promotes the uptake of cations, such as: potassium (K+), magnesium (Mg+) and Calcium (Ca++). Also, the nitrate form of nitrogen, increases the pH of soil solution near the root system, which is an especially important feature in tropical acidic soils. The nitrogen in Multi-K™ potassium nitrate is entirely in nitrate (NO3-) form, which makes it a suitable fertilizer for fertigation. A better solution is to use Multicote™, Multicote™ AGRI and CoteN™, controlled-release fertilizers, which would release gradually all plant nutrients according to plant’s needs, while preventing leaching losses. In humid tropics, at high rainfall, or irrigation; apply every 2-4 weeks, while with MulticoTech™ (4M), apply every 10 weeks. NutriNet™ is a unique software program that will assist you to workout the recommended fertilizer rates according to the expected yield under your growing conditions. Soil-applied fertilization schedule and fertigation rates may vary according to cultivar, climatic conditions, growth stages and expected yield. By using Haifa NutriNet™ program on-line, you may obtain Haifa’s recommendations most suitable to your growing conditions by selecting the expected yield, growing method and growth stages. * Fertilizers produced by Haifa. For details, see Appendix X. * Fertilizers produced by Haifa. For details, see Appendix I. The dry form of Multi-K™ is also suitable for broadcasting in the banana plantation, either manually or with fertilizer spreaders. Two forms of Multi-K™ enable perfect matching with the grower’s means, i.e. soluble, made of crystalline particles, and prills (2-3 mm granules). Both forms are fully water soluble, however, the prills form may be most suitable for hand and mechanized spreading. The prills is the form of choice also for blending withother granulated fertilizers. The amount of fertilizer depends on size and age of the stalk and on the number of stalks per mat (Tab. 37). Fertilization of young plants should be started with N-P2O5-K2O ratio of 3-1-6 (when higher analysis formula is used, amount of fertilizer per mat should be reduced, proportionally), with 2-3% magnesium, applied every 2 months, and increasing gradually to 2.5 kg to 3.0 kg at flowering and fruiting time, 10 to 18 months later. 2– In case of a fertilizer with higher analysis, the amount should be reduced proportionally. 3- Foliar applications of micronutrients may be applied 1-2 times per year. 4- Iron applications, especially in calcareous soils, should be made 1-2 times per year. If manganese (Mn) and zinc (Zn) are needed, at least one nutritional spray containing manganese and zinc is recommended annually. Copper should be included in the spray if no copper-containing fungicide is used. Banana plants growing in acidic sandy soils may be fertilized with 0.25 to 0.5 kg dry iron sulfate 1-2 times during the warmer part of the year. Banana plants growing in high pH, calcareous soils may be fertilized with 30 to 60 g of chelated iron material (EDDHA) during the warmer part of the year. The following is considered a common practice in several banana growing countries:Please note that application values may differ among locations, yields, application methods, etc., but generally the application rate of potassium is 1.5-2 fold higher than that of nitrogen. KCl during the wet season only. ** 30% of the annual potassium requirement should be applied at the time of bunch initiation. The annual quantity of the recommended fertilizers should be divided to as many and as frequent applications as possible. In plantations without irrigation facilities, the applications should be done during the rainy season only. * The annual amount of the recommended fertilizers is divided to 6-8 applications. In growing areas without irrigation facilities, the applications are done during the rainy season. * Applied in split applications throughout the growing cycle. Fertilization is done on the 3rd, 6th and 9th months after planting. * in regions with neither water salinity - nor soil salinity problems, SOP can be replaced by KCl during the wet season only. ** 30% of the annual potassium requirement should be applied at the time of bunch initiation. Can. Isl – surf. Irrig. Haifa'’s Multicote™ Agri products contain polymer-coated fertilizer granules, that slowly release plant nutrients into the soil solution at a pre-determined rate. Moisture in the soil is absorbed by the encapsulated fertilizer granules - dissolving the nutrients inside and releasing them into the root zone. Why to use Multicote Agri? In tropical regions, where heavy rains may leach out plant nutrients from the root zone and where many fertilizer applications are required to offset loses, Multicote™ Agri will be the ultimate solution. It is not affected by soil moisture or heavy rainfall, as it releases gradually plant nutrients. Since banana crop requires heavy and continuous feeding, many fertilizer applications are required. Consequently, Multicote™ Agri saves on number of applications, thereby it considerably saves labor. Many experiments and field trialsproved the efficiency of this product, resulting in higher yields. The efficiency of Multicote™ Agri , due to a continuous nutrients release into the soil solution is much higher than conservative fertilizers. Consequently, lower rate of Multicote™ Agri may be applied; saving on fertilizer expenditure as well as on freight cost. Wherever environmental concern over fertilizer ground-water contamination is an issue, Multicote™ Agri will be the product of choice. In tropical regions with heavy rains, the use of Multicote™ Agri will result in considerably less losses of plant nutrients as compared to conventional fertilizer applications. Also, less applications per year will be required. In irrigated banana plantations where fertigation is practiced, Multicote™ Agri can be applied during the rainy season where irrigation is not being practiced. This combination of both application methods, will save labor and ensure continuous plant nutrients supply during the rainy period. In tropical regions and where heavy rains may leach plant nutrients from the root zone of banana plant, Multicote™ Agri is recommended. Based on field trials and growers experience, Multicote™ Agri 17-7-25+2MgO can be applied every 2 months at a rate of 260 g/mat /year. In irrigated fields, where only part of the growing period (about 4 months) is a rainy season, two applications of Multicote™Agri at a rate of 145 g / application /mat are recommended. The rest of the time, about 8 months, water-soluble fertilizers should be fertigated. A water-soluble N-P-K fertilizer of a 3:1:4 ratio may be applied, such as 14-5-18 or 17-6-22. Eight monthly applications, of 150 g / application / banana plant, are recommended. In Colombia, in cooperation with Chiquita, Multicote™ Agri was compared to the regular commercial treatments (control). The N-P-K quantity was the same in all treatments while four combinations of Multicote™ Agri content in each treatment varied from 100%, to 75%, 50% and 25%. The growth of the plant was measured: circumference, height of mother and daughter plants, % bunches emerging per week and number of weeks per plant. Multicote™ Agri treatment produced higher and earlier yields, compared to the control plot. Multicote™ Agri increases the profits of banana growers by reducing number of applications and fertilization rates, and by producing higher yields. These properties make banana plants extremely sensitive to slight variations in soil water content, and emphasize the importance of correct irrigation scheduling. Nutrigation™ (fertigation) is a technique that combines irrigation with fertilization. During the several decades since this technique has been developed, it became well established as a potent method in modern agriculture, resulting in higher yields and improved quality of the crops. The main advantage of all micro-irrigation systems is that they are spread across the field and a large area can be irrigated from a single control point. Labor requirement is therefore minimal, uniformity of application is high, a specific root zone area can be continuously wetted and any desired irrigation regime can be applied. In addition, water loss by evaporation is minimal especially when drip irrigation is practiced. Soluble fertilizers can be applied easily and efficiently through the system directly to the root zone. When fertigation is carried out via drip system or micro-sprinklers, it allows expanding the growing areas to marginal lands with a limited water-holding capacity. Such instances may be sandy or rocky soils, where accurate control of water and nutrients in the immediate vicinity of the root system is critical. In Hawaii, shifting to drip irrigation combined with nutrigation in bananas has doubled the yield obtained from a well-managed, conventional sprinkler-irrigated plantation. Table 44 provides an illustration for the responsiveness of the banana to Nutrigation™ with Multi-K™ potassium nitrate. * Benefit/cost ratio expresses the ratio between the additional benefit/income and the additional cost associated with the treatment. The results of this trial show that Multi-K™ is markedly superior to K2S04, agronomically and economically. * In regions with neither water salinity - nor soil salinity problems, SOP can be replaced by KCI during the wet season only. The annual quantity of the recommended fertilizers should be divided to weekly applications. During the rainy season fertilizers should be applied by means of short (technical) irrigation cycles, designed for this purpose only. The annual quantity of the recommended fertilizers should be divided to weekly applications. The common practice is to divide the entire amount of fertilizers by the number of the irrigation weeks. The fertilizers are supplied in weekly amounts. Alternatively, the fertilizers can be applied continuously with the irrigation water, at a constant rate - proportional fertigation. * 30%of the annual potassium requirement is applied at time of bunch initiation. When the banana crop require plant nutrients, which are fixed and immobile in the soil. When deficiencies are detected at advanced stages of plant growth, and a quick correction is necessary. When root activity is hampered by external stresses such as low soil temperature, poor aeration, nematodes, rodents, or damage by machinery. When the effectiveness of direct soil application is limited due to weed infestation. As foliar application bypasses weed competition, this method ensures high availability to the target organs. When the roots are unable to provide the plant with certain nutrients at adequate rates, during specific critical stages of growth. This syndrome may take place even in fertile soils. In Martinique, Philippines, Colombia and elsewhere it has become a prevailing practice to apply Haifa Bonus npK at a rate of 70 -100 g/mat (25-30% of the yearly potassium requirement) at the time of bunch initiation. The high availability of Haifa Bonus npK to the plant makes it the best fertilizer in meeting the plant’s increasing demand for nutrients at this critical stage of plant development that determines yield. In Colombia, Mexico and elsewhere, foliar sprays during the vegetative growth and bunch development were found to be remarkably beneficial in increasing bunch weight, number of hands per bunch and number of fingers per hand (Tabs. 50, 51). * Guerrero and Gadban, 1992, “La Ceiba” Santa Maria, Colombia** Six spray applications at 2% concentration, at 30-days intervals. * Four spray applications at 30-days intervals at 2% concentration. *** Ratio between additional benefits and the additional cost associated with the treatment. It is a Costa-Rican banana growers’ practice to make 44 foliar-spray applications per year to control Black Sigatoka disease. Researchers from CORBANA (Corporacion Bananera Nacional) have found positive effects on vegetative growth and bunch development, when 22 of these applications were combined with Haifa Bonus npK at600 g/ha (Tab. 52). Ground spraying: 2-4% Haifa-Bonus npK in 300-400 liter/ha spray solution. Air spray application:7-8% Haifa-Bonus npKin 20 liter/ha spray solution. When application is done by ground spraying, the rate should be 2-4% Haifa-Bonus npKdissolved in 300- 400 liter/ha spray solution. Total rate: 6-12 kg/ha. When application is done by aerial spraying, the rate should be 8-10% Haifa-Bonus npK dissolved in 20 liter/ha spray solution. Applications can be done throughout the year, up to 22 applications, that can be tank-mixed with pesticide sprays. Haifa-Bonus npK is highly compatible with most pesticides used in banana cultivation. It is also compatible with other plant nutrients used for correcting common deficiencies such as magnesium, zinc and boron. It is advisable to confirm compatibility of your intended mix by preparing a sample of the spray materials at their recommended concentrations in order to rule out the possibility of a detrimental cross reaction. This mixture should be sprayed onto small area prior to commercial treatment, in order to assess whether an adverse effect occurs. 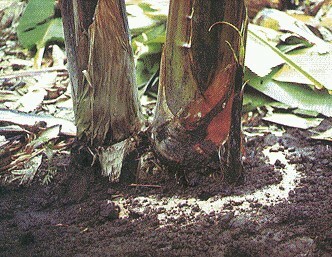 High temperature and low humidity may increase the susceptibility of banana plants to possible spray injury. The preferred time for spraying is early morning or late evening. Plants under stress conditions should not be sprayed!